The Buttercream Problem 2: What Problem? | "blackberry-eating in late September"
The Buttercream Problem 2: What Problem? Thanks for the support and thoughts on my previous buttercream post. I appreciate knowing you are out there, lurkers and likers! The title of this post might be a bit of a lie, because can you really call something “Problem, part 2” if it isn’t too much of a problem anymore? Maybe “The Buttercream Project” would be more accurate. Anyway, I owe this amelioration of gloop, sludge, and anxiety in part to my own intuition, but in larger part to Leah at “So, How’s it Taste?” and her recipe for Cinn-Chili Chocolate Cupcakes with Cinnamon Buttercream. With a chapter draft submitted and a guiltlessly girly shopping trip/reward for my efforts over, I wanted to bake a little something for my officemates AND do a buttercream practice. It’s important to sift the powdered sugar. Otherwise you end up with little clumpy bits that don’t incorporate completely (which happened at New Year’s on the blue poo cake). It’s important that the butter be fully softened, and that you whip it up well before adding any of the sugar, lest it not incorporate fully (which happened at New Year’s on the blue poo cake). A couple of tablespoons of whole milk help smooth things out. I probably should use champagne extract or flavoring, not champagne itself, because so little liquid is needed to keep this pipe-able and smooth (but not turning into blue poo. I’m just saying…). 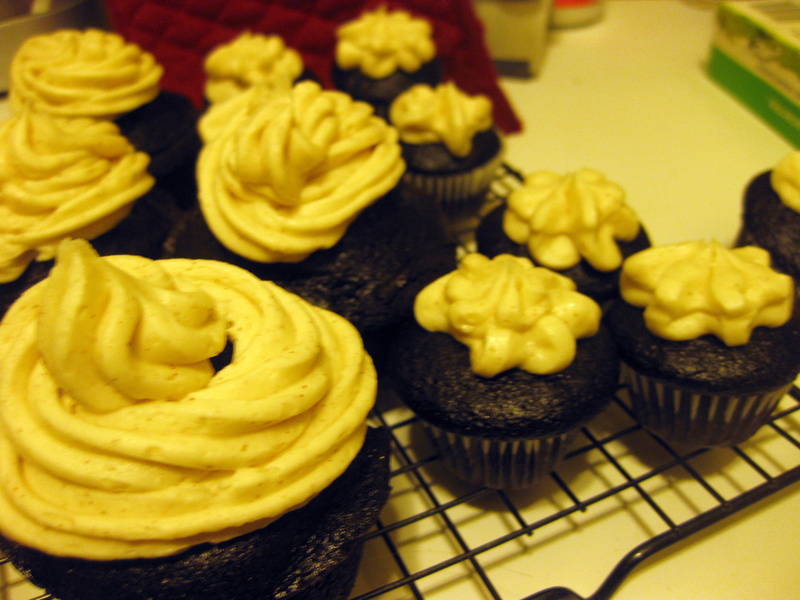 So the frosting whipped up really nicely – smooth and buttery and even – but the cupcakes were no slouch either. The combo of chocolate, cinnamon, and cayenne is, I’ve decided, one that should be present in everything from cupcakes to hot cocoa to coffee to a spread for sourdough toast. It was warm and toasty and dark and rich and left just a little lingering heat in the back of your throat after the last swallow of cupcake. 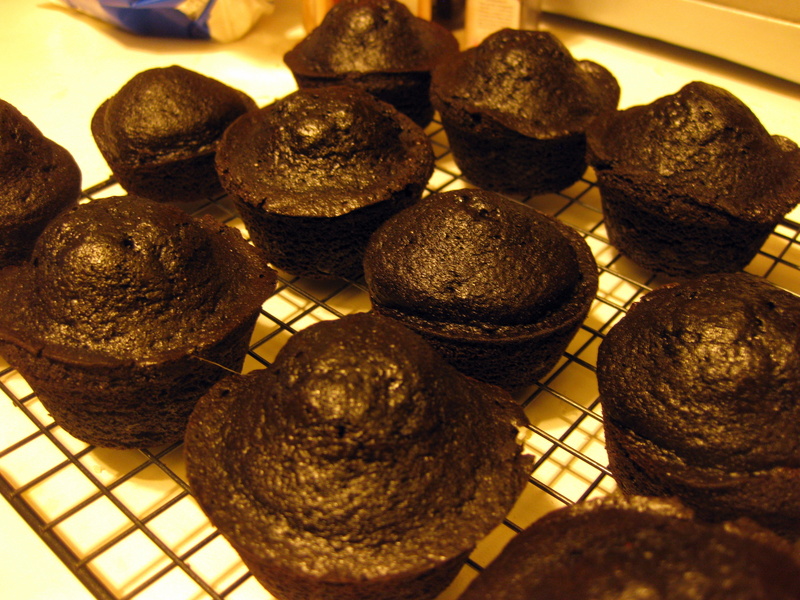 The cakes were really, really dark – almost black – because I used Hershey’s “Special Dark” cocoa powder instead of just the regular stuff. They had a nice moist crumb and weren’t overwhelmingly sweet. The buttercream was delicious too. It was pretty sweet, though that’s difficult to combat, I think, but the heat of the cayenne and the warmth of the cinnamon in the frosting cut the sugar. 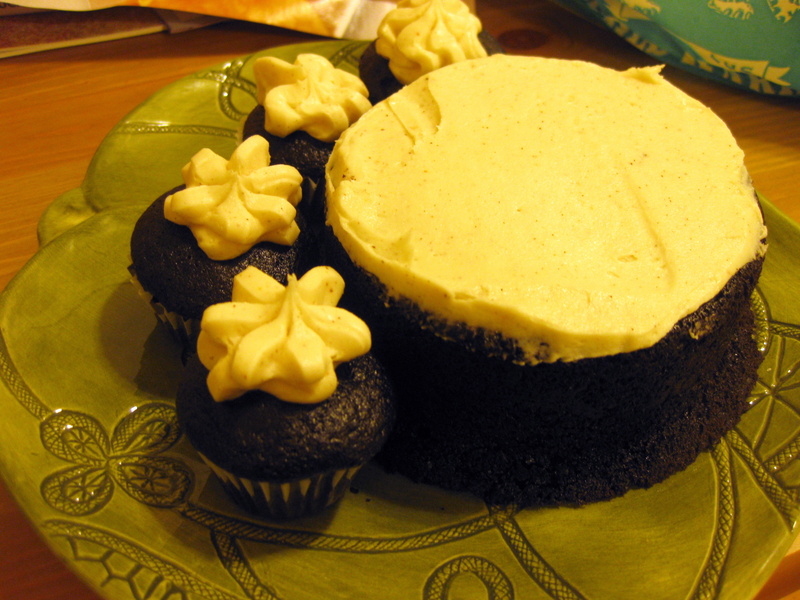 Also, after a night in the fridge the frosting seemed less aggressively sweet – giving the butter and sugar time to hang out together might have done something the mellow the cloying flavor buttercream can have. I used less cayenne in the frosting than Leah’s recipe specifies, though I did add the barest sprinkle over the top when the cupcakes were all frosted. Here’s what I learned about the process of frosting: cupcakes are easy, and a properly made buttercream spreads with surprising smoothness over a flat surface (I made one tiny “cake” for the bride and groom as a taster and smoothed icing across the top). With an offset spatula or a metal scraper at my disposal, I bet I can get the thing even and gorgeous. Here’s what I learned from the bride: she LOVES the idea of doing cupcakes and mini cupcakes as additions to the cake, and we’ve decided to use an asymmetrical cake stand for the actual cakes. This means I don’t have to stack anything, just make three separate, differently sized cakes, and a Subaru-load of cupcakes. So here’s the plan: the cakes will get frosted with buttercream and decorated in some as-yet-to-be-determined way. The cupcakes will get frosted with a star tip much like I’ve done here, and possibly drizzled with blue crystal sprinkles. As for the mini cupcakes, I found a tutorial for making pansy-like flowers out of buttercream on minis, and the next time I do a trial run I’m going to give this a try to see if it’s something me and my meager piping skills can pull off. Next month: I’ll make the champagne batter the cake will actually be made of and bake it in cupcake form so I can start to get times down. It wouldn’t do to have dry cupcakes. Then I’ll try out this flower pattern on the minis and see how it turns out. With luck, it will go as well as this month’s new buttercream recipe did! Stay tuned… I added a “wedding” tag, and all the buttercream and cake-related posts will end up in that category for easier access. This entry was posted in Baking, blogs, Desserts, party food, Sweets of sin, vegetarian, Wedding and tagged chocolate cupcakes by Chelsea. Bookmark the permalink.